Pughe, J. S. “A Thanksgiving Truce.” Illus. in: Puck, v. 58, no. 1499 (1905 November 22), centerfold. Copyright 1905 by Keppler & Schwarzmann. Library of Congress Prints & Photographs Division. Caption: The Bear (with deep feeling) Here’s hoping that when next we meet, we see you first. 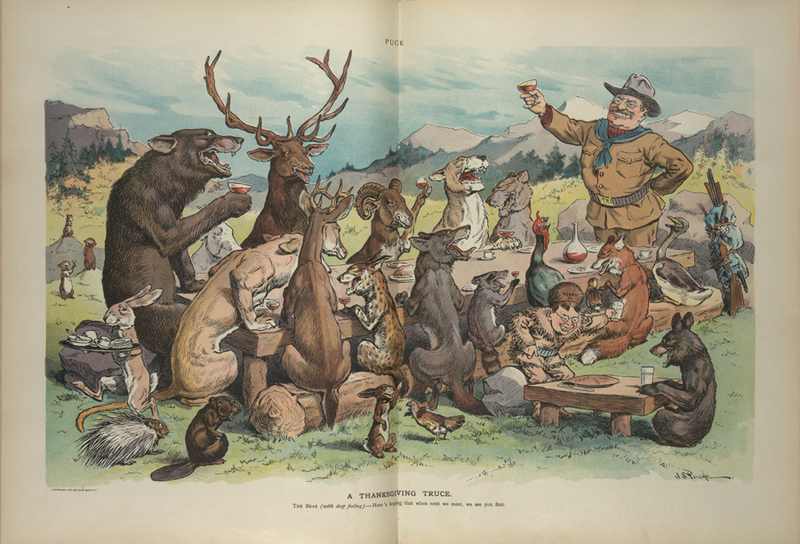 Summary: Illustration shows Theodore Roosevelt, wearing his rough rider uniform, sharing a feast with many wild animals sitting around a large banquet table in the wilderness. A bear is making a toast. “Teddy Jr.”, wearing buckskin, is sitting on a rock at a small table with a bear cub. Why do you think the creator titled this cartoon “A Thanksgiving Truce”? Use specific details from the source to support your response. What do you think the bear meant when it said (with deep feeling), “Here’s hoping that when next we meet, we see you first.”? Do some research to learn some more about Theodore Roosevelt and the Rough Riders. What discoveries did you make? What new perspectives of this cartoon do you now have?